This is the story of a Sufi Saint named Muni Ji who hails from Kanpur. 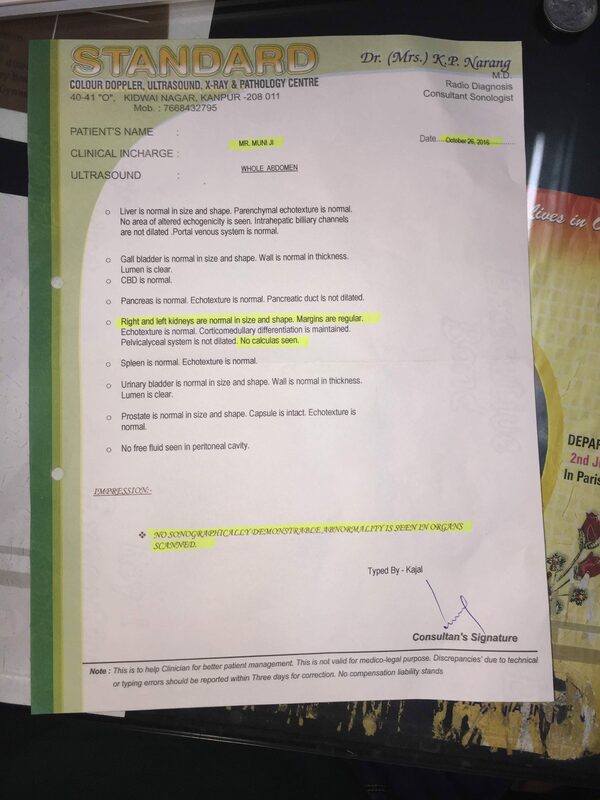 He came to consult Dr. Ravi on April 2016 with the complaint of kidney stone. He told the doctor that since one year, he has been suffering from severe unbearable pain in the left side of the stomach that would exacerbate on doing yoga asans, lifting heavy things, or while driving a bike. The pain was so annoying that it began to interfere in his daily routine. He also added that there were many incidences where the pain was so unbearable that he had to take an injection to relieve the pain. The pain was constant and rapid. He started taking homeopathic medicine to deal with unbearable pain. He got some relief but that was not permanent. Before coming to Dr. Ravi, he was diagnosed with the 8.5 mm stone in his left kidney. He was worried and wanted a permanent solution. Dr. Ravi assured him that he will be fine and will very soon get rid of kidney stone. After taking the treatment for almost 2 months, he came to see Dr. Ravi on July 2016 with Ultrasound report. The report showed improvement in his condition. The kidney stone had shrunk to 4 mm but was still there. With the positive report, Muni Ji was hopeful and positive towards Dr. Ravi's treatment process. After taking the treatment for almost 5 months, Muni Ji came for a follow-up in October 2016 with his USG report. The reports showed the absence of left kidney stone. The stone had dissolved with the treatment and pain had subsided. He totally got rid of the pain. He was fully satisfied with the treatment process.